Durban, are you ready for Heineken® to #SHAPEYOURCITY with DJ Lag, Sanele Cele and Anna Savage? Heineken®, the world’s leading international premium beer, have teamed up with an innovative trio, producer DJ Lag, designer Sanele Cele and artisan-market coordinator Anna Savage to host a phenomenal event in Durban as part of Heineken®’s #SHAPEYOURCITY competition – but Durban needs your vote if you want your city to win. Three of South Africa’s most cosmopolitan cities – Joburg, Cape Town and Durban have been selected in Heineken®’s global campaign to transform the cities of the world. Each city will compete for bragging rights, and the opportunity to host a unique, show-stopping, City Shaping Experience, courtesy of Heineken®. 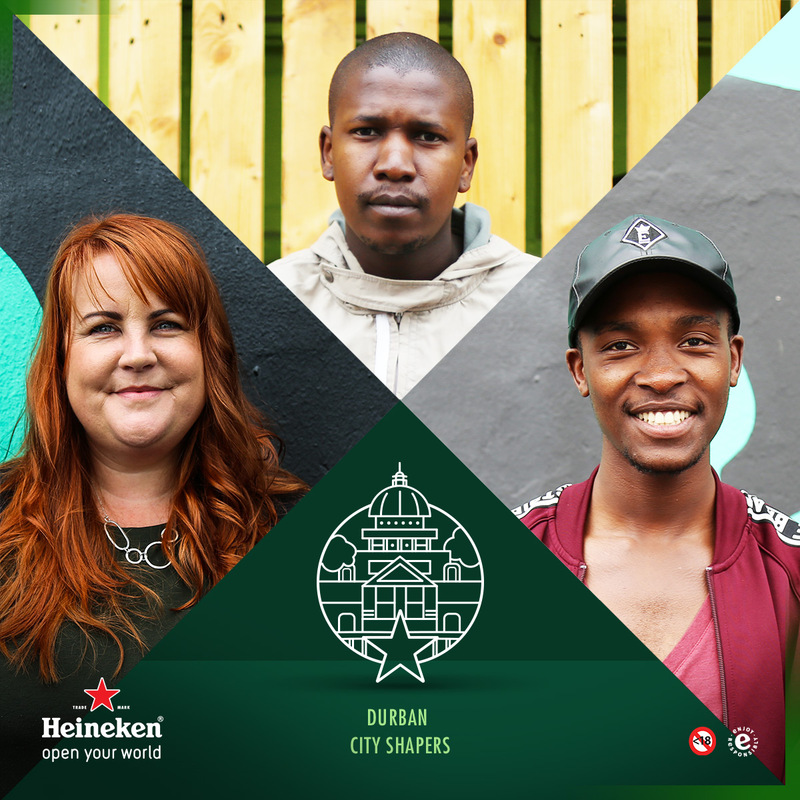 City Shapers DJ Lag, designer Sanele Cele and artisan-market coordinator Anna Savage make up Team Durban and together with Heineken® they are gearing up to transform a secret vacant city space into an installation fit to surprise and delight all urban Durbanites. DJ Lag is an underground house producer, as well as one of the originators of a new genre of local music, Ggom, which is inspired by township life. His skills as both an artist and a producer give him unique insight into Durban nightlife and event production. With his finger firmly on the pulse of South African music, DJ Lag embodies the social lifestyle and urban attitude that is synonymous with Heineken®. Joining DJ Lag as a ‘City Shaper’ is Sanele Cele, the designer behind Durban-based fashion and lifestyle brand, Tempracha, which he proudly named after the endless sunshine days of his city. If anyone can convey a design style that is unique to the Durban lifestyle scene, but still has the capability to thrive globally – just like Heineken® – then Sanele is your man. Anna Savage is the artistic force behind the I Heart Market, which takes place at the famous Moses Mabhida stadium in Durban every month. Under her guidance, this four-year-old artisan market has grown from a small gathering of crafters, to a busy event that showcases innovative South African craft, design goods, food and live music entertainment. Anna is also part of the team responsible for the I Heart Durban parties. Anna will no doubt elevate Durban’s City Shaping experience with her inspired and innovative spirit. “We are thrilled to collaborate with our three incredible City Shapers, who each represent Durban in such a vibrant and unique way. Durban, are you ready to be on the global stage? Then get voting!” says Themba Ratsibe, Marketing Manager, Heineken® South Africa. Distinctive, limited edition Heineken® Cities bottles, exclusive to each city, have just arrived in stores with all the voting details. Simply grab a Heineken, find the unique code under your bottle cap and dial *120*222# to enter your code. Then vote for either Joburg, Cape Town or Durban as the city you’d like to see receive a City Shaping experience. By voting, you also stand a chance to win the trip of a lifetime to Heineken®’s home city, Amsterdam, as well as great instant prizes. Soweto Fashion Week: The Journey to Success! Mak1One, ThingKing and Heineken® team up to shape Cape Town!